If you plan on cooling off with your pup by taking a dip this summer, make sure to keep them safe. Dog owners must remember that even though their pooch may be a natural swimmer, they still face the same risks of drowning and other issues that humans do. 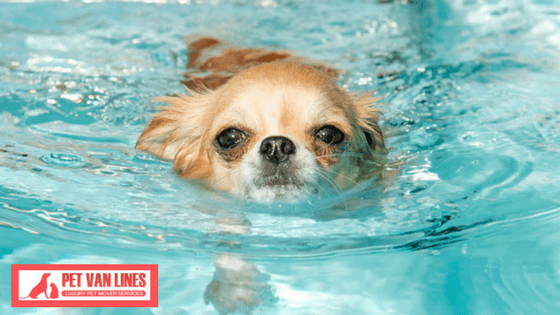 Exercise the proper amount of caution during swimming sessions to ensure that your dog stays safe, doesn’t get exhausted and can be brought back in the event they stray too far into the water. As dog lovers and an experienced pet ground transportation company, we can offer the following dog swimming safety advice to help prevent scary incidents and ensure your pup has a safe, fun summer. Rule number one with pet swimming is simple: no swimming without supervision. This includes giving animals access to areas like backyard pools where they may enter the water without permission. Fence off these areas if your pet is allowed to free-roam near them, and keep constant watch near bodies of water in case your dog decides to take an unscheduled plunge. Dogs are just like us: they need to learn to swim. If your pet has limited experience swimming, make sure they know how to use both their front and rear legs to tread water. You can practice with them by holding underneath their belly while they paddle and getting them to engage their feet. Give the animal lots of praise when they are able to get all four legs a-wigglin’. Practice in shallow water, and definitely practice getting the animal to come to you from the water when you call them. Also, teach them a good spot to exit the water anytime there is not a gradual shore, such as when you are at a pool or a dock. Consider getting a doggy dock if there are no stairs or a clear, safe exit. Most importantly, teach them when “no” means “no” in regards to jumping in the water since not all areas are safe. While swimming with your pet, note how long it takes for them to get tired. Keep in mind that certain breeds or builds of dog are poorer swimmers and more prone to sinking like a rock than keeping up with Michael Phelps. For instance, breeds with broad chests like English bulldogs and short, stocky dogs like basset hounds and dachshunds can get tired more easily since they have a harder time keeping afloat. Most dog drownings occur because the animal completely ran out of energy to swim. Observing this point can be tough because dogs like to act like troopers even as they start to feel drained. Take frequent breaks, give your dog lots of clean water and keep them from going back in if they have already had a long day of swimming. Also, keep in mind that large dogs can take you underwater with them when they get tired, so be particularly wary of energy levels if you have a dog over 20 lbs. Dog life vests are a must-have for dogs entering larger bodies of water. No matter how great of swimmers they are, there are just too many risks when swimming at a lake, large pond or ocean for an extended period of time. Find a vest that fits them comfortably, won’t slip off and that has a sturdy handle for pulling them out the water when needed. Dogs tend to swallow a lot of water when they swim, so be sure that the water is safe and doesn’t have bacteria. Many lakes have toxic algae blooms during hot summer months, for example. Also, be sure to take a look at their ears and clean them out after swimming since dogs are more prone to swimmer’s ear than we are. If you are moving long-distance to a new pond and do not want to board your dog on a plane or take them along for the initial big haul, consider using dog transportation services like Pet Van Lines. We keep your dog comfortable and make sure they take frequent exercise breaks during their long journey. While we can’t let them take a dip before getting back in the van, we can bring them right to you for more splashy summer fun in your new town! If you are moving soon and interested in pet moving alternatives, you can get a free quote today.